There have been many angry comments from people opposed to the killing of whales in the Faroe Island and in Taiji, Japan AND from people who support the killing of whales in the Faroe Islands and Taiji. It is understandable that the horrifically brutal images of this obscenity called “The Grindadrap” inspires such anger, and people react by venting their emotions in rhetoric ranging from revulsion to unleashing of hateful comments. Personally I don’t understand people who get angry in defense of slaughter and cruelty but they are free to do so (on their own pages and their own forums) just not on mine. I do want to make my personal views clear here. I am not responsible for the opinions and views and expressions of those opinions in the comment section of my page. I remove some that are over the top offensive, but for the most part I do not interfere with people expressing their anger. But I also wish to make it very clear that I hold no animosity or anger towards the people of the Faroe Islands, Japan or the people of Denmark for the simple reason that not all Faroese or all Danish people kill whales and dolphin or support the killing of whales and dolphins. I am not, nor do I advocate being anti-Danish, anti-Faroese or anti-Japanese. Aside from the fact that it is unfair to tar every Dane and every Faroese with the same brush, my own Grandfather was born in Copenhagen and his last name was Larsen. I would have to condemn my own mother to consider myself anti-Danish. People unfortunately tend to react out of a primitive tribal instinct and thus are quick to lump all members of a given “tribe” into one big tribe and if they oppose the actions of some members of said tribe they tend to oppose the tribe as a whole. By the same token others tend to view a criticism of a member of their “tribe” as a criticism of themselves. Basic human nature really, in a world divided by fake boundaries and imaginary lines on a map. There is also a difference between the government of a nation and the people of a nation. The government does not represent the views of all the people and in many cases it does not represent the views of the majority of the people. Thus criticisms of the Danish, Faroese and Japanese governments does not mean a condemnation of the average citizen. The same holds true of boycotts. When cruise ship lines decline to visit the Faroes because of the Grind, that is their choice. When people refuse to buy Danish or Faroese products because they deplore the killing, that is a valid economic tactic to exert pressure on the atrocity. It is not anti-Danish or anti-Faorese, it is directed against the activity because unfortunately appealing to people on ethical grounds is not as effective as exerting pressure on economic grounds. I deplore comments that respond by wishing death or injury on those who inflict death and injury and I have never made any comments like that myself. However when I hear people being outraged by hateful comments directed at people who inflict agonizing pain and death to sentient self-aware intelligent beings, my reaction is to understand the helplessness of the people making those comments and how in their anger and their frustration they vent their spleen. But any comment, no matter how hateful can’t even begin to compare with the unimaginable agony inflicted upon the whales and dolphins on those bloody gore slippery beaches in the Faroes and in that Cove of shame called Taiji. So for people to get outraged at such comments while supporting cruelty and death just seems extremely petty to me. At the same time we must channel this anger into exerting outside pressure against the horror of the Grindarap and the massacres in Taiji. Both the Japanese and the Faroese have said they will never stop the killing. The truth is they will, if enough pressure is consistently applied. The Australians in 1977 said they would never stop whaling. They did a year later. The Azoreans in 1979 said they would never stop whaling. They did. Politicians once vowed that women would never be given the right to vote, that slaves would never be set free, that fascists would never be stopped, that veganism would never be taken seriously. History has demonstrated that there is no such thing as never. Sometimes it takes time and that is why the Cove Guardians call the campaign Operation Infinite Patience. 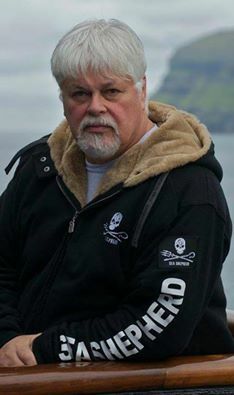 Sea Shepherd has opposed the seal hunt in Canada since 1974, the Grindadrap in the Faroes since 1983, the slaughter of dolphins in Taiji since 2003, the Southern Ocean since 2002. We never give up. It took three decades to undermine the market for seal pelts in Europe, but it was achieved. Patience, Persistence, Perseverance are the keys to success. Every success makes us stronger, every failure also makes us stronger and every time we are knocked down we simply get up and move forward again, because we are a movement, and thus we cannot be stopped by the removal of any of our leaders including myself. Like the Roman army, when a soldier falls in the front line, a soldier in the second line replaces him or her and the march continues forward, onward and upwards. When I did an interview yesterday with Faroese TV, the interviewer said, "now that you failed to save these 33 whales, are you not concerned about losing support?" Of course he ignored the fact that this has been the lowest number of whales killed in five years in the period from June through September but the publicity from the arrests brought even more support with more volunteer applications, replacement boats donated and I noticed a recruitment of 10,000 plus new friends on this page alone since Satrurday. A week ago the number was under 442,000 and today it is over 452,000 and well on the way to becoming a half a million. When our critics tell us to go home, my response is that I am home because I do not recognize those fake borders. The ocean has no such borders and the oceans are not the property of any group of people sitting inside their imaginary nations. We oppose the killing of pilot whales in the Faroes and dolphins in Japan simply because we represent the interests of these species and their right to live unmolested, unenslaved and unslaughtered. The Faroese do not own the pilot whales and the Japanese do not own the dolphins and the whales. Each and everyone of us has the right to step foot on each and every part of the planet Earth despite Australian Prime Minister Tony Abbott saying that “Jesus has a place for everyone and everyone in their place and it’s not everyone’s place to come to Australia” while conveniently forgetting he was born in London, England. A couple of years ago I stood on a peak in the Faroes and I felt at home just as when I stood on the edge of the Ross Ice Shelf or in the middle of the Namibian desert. This is my planet and it is your planet and it is also the planet that is home to each and every species that exists. We have a right to defend whales in the Faroes and in Japan, and we have a right to express our anger at those who kill them. I would however like to make a request of people who post on my page and that is to try and control your urge to wish death, curses and hellfire on the killers. Try not to condemn them for their nationality and instead focus on the heinous actions and those who commit such atrocities. Take some advice from Jesus who said, “they know not what they do.” It is our job to convince them of the evil of their actions and it is our job to defend life from those who inflict death and to oppose those who inflict cruelty. Each and every human being knows intuitively that cruelty and killing is wrong. We are not born as killers, we are taught to be killers. And as for those who criticize us because we show pictures of children sitting on, dancing on, poking, kicking and mutilating whales, well, they should simply stop bringing their kids to these murder-fests and taking pictures of them doing these things. It is my wish that one day all whales and dolphins will be able to roam the seas, living in accordance with their cultures and in peace, free from the lethal tyranny of the ecological insanity of humanity. Personally I don’t understand people who get angry in defense of slaughter and cruelty but they are free to do so (on their own pages and their own forums) just not on mine. I do want to make my personal views clear here. But I also wish to make it very clear that I hold no animosity or anger towards the people of the Faroe Islands, Japan or the people of Denmark for the simple reason that not all Faroese or all Danish people kill whales and dolphin or support the killing of whales and dolphins. I am not, nor do I advocate being anti-Danish, anti-Faroese or anti-Japanese. Aside from the fact that it is unfair to tar every Dane and every Faroese with the same brush, my own Grandfather was born in Copenhagen and his last name was Larsen. I would have to condemn my own mother to consider myself anti-Danish. People unfortunately tend to react out of a primitive tribal instinct and thus are quick to lump all members of a given “tribe” into one big tribe and if they oppose the actions of some members of said tribe they tend to oppose the tribe as a whole. However when I hear people being outraged by hateful comments directed at people who inflict agonizing pain and death to sentient self-aware intelligent beings, my reaction is to understand the helplessness of the people making those comments and how in their anger and their frustration they vent their spleen. But any comment, no matter how hateful can’t even begin to compare with the unimaginable agony inflicted upon the whales and dolphins on those bloody gore slippery beaches in the Faroes and in that Cove of shame called Taiji. So for people to get outraged at such comments while supporting cruelty and death just seems extremely petty to me. Both the Japanese and the Faroese have said they will never stop the killing. The truth is they will, if enough pressure is consistently applied. The Australians in 1977 said they would never stop whaling. They did a year later. The Azoreans in 1979 said they would never stop whaling. They did. Politicians once vowed that women would never be given the right to vote, that slaves would never be set free, that fascists would never be stopped, that veganism would never be taken seriously. History has demonstrated that there is no such thing as never. Sometimes it takes time and that is why the Cove Guardians call the campaign Operation Infinite Patience. Sea Shepherd has opposed the seal hunt in Canada since 1974, the Grindadrap in the Faroes since 1983, the slaughter of dolphins in Taiji since 2003, the Southern Ocean since 2002. We never give up. It took three decades to undermine the market for seal pelts in Europe, but it was achieved. Patience, Persistence, Perseverance are the keys to success. Every success makes us stronger, every failure also makes us stronger and every time we are knocked down we simply get up and move forward again, because we are a movement, and thus we cannot be stopped by the removal of any of our leaders including myself. Like the Roman army, when a soldier falls in the front line, a soldier in the second line replaces him or her and the march continues forward, onward and upwards. When I did an interview yesterday with Faroese TV, the interviewer said, "now that you failed to save these 33 whales, are you not concerned about losing support?" Of course he ignored the fact that this has been the lowest number of whales killed in five years in the period from June through September but the publicity from the arrests brought even more support with more volunteer applications, replacement boats donated and I noticed a recruitment of 10,000 plus new friends on this page alone since Satrurday. A week ago the number was under 442,000 and today it is over 452,000 and well on the way to becoming a half a million. When our critics tell us to go home, my response is that I am home because I do not recognize those fake borders. The ocean has no such borders and the oceans are not the property of any group of people sitting inside their imaginary nations. We oppose the killing of pilot whales in the Faroes and dolphins in Japan simply because we represent the interests of these species and their right to live unmolested, unenslaved and unslaughtered. The Faroese do not own the pilot whales and the Japanese do not own the dolphins and the whales. Each and everyone of us has the right to step foot on each and every part of the planet Earth despite Australian Prime Minister Tony Abbott saying that “Jesus has a place for everyone and everyone in their place and it’s not everyone’s place to come to Australia” while conveniently forgetting he was born in London, England. A couple of years ago I stood on a peak in the Faroes and I felt at home just as when I stood on the edge of the Ross Ice Shelf or in the middle of the Namibian desert. This is my planet and it is your planet and it is also the planet that is home to each and every species that exists. We have a right to defend whales in the Faroes and in Japan, and we have a right to express our anger at those who kill them. I would however like to make a request of people who post on my page and that is to try and control your urge to wish death, curses and hellfire on the killers. Try not to condemn them for their nationality and instead focus on the heinous actions and those who commit such atrocities. Take some advice from Jesus who said, “they know not what they do.” It is our job to convince them of the evil of their actions and it is our job to defend life from those who inflict death and to oppose those who inflict cruelty. Each and every human being knows intuitively that cruelty and killing is wrong. We are not born as killers, we are taught to be killers. And as for those who criticize us because we show pictures of children sitting on, dancing on, poking, kicking and mutilating whales, well, they should simply stop bringing their kids to these murder-fests and taking pictures of them doing these things. It is my wish that one day all whales and dolphins will be able to roam the seas, living in accordance with their cultures and in peace, free from the lethal tyranny of the ecological insanity of humanity.